Good posture is the foundation for all or our movement so I wanted to dedicate another post about how our posture impacts our balance. When our posture is aligned well, our body is at the optimum configuration. Even as you look at yourself in the mirror, you will see openness and confidence. Taking a look at figure on the left, with the Good Posture figure: lines 1, 2, and 4. are parallel to the floor. Line 3 is the vertical line that essentially lines up with our spine through our body's center. You will notice just from looking that there is a mirror on either side of the vertical axis: a balance. From there, once you start to walk, it will be easier to achieve a grounded, even and smooth gait which is essential in dancing kizomba. When our body is not aligned properly you will see that the parallel lines go away. In one example of Poor Posture, line 5 show a tilted head which will put more weight on the side the head is tilted towards. This can cause you to have an uneven walk, especially when you are moving towards the side you are tilted to. Its like when you're rolling a grocery cart that has one wheel slightly off center: the art pulls towards that side and some work is required to steer it straight. Line 6 show knees that are not aligned and line 7 shows ankles that are tilted downward. This creates different stresses on the hips and feet, again contributing to an uneven gait. 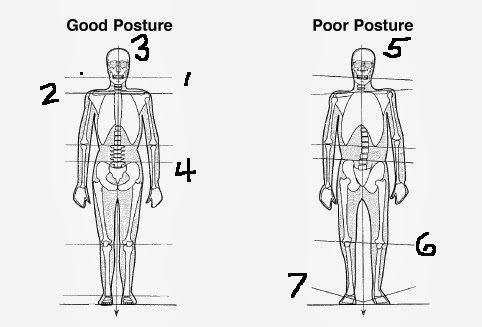 Now, let's look at the side view and check the alignment for good posture (far right in the diagram to the right). Notice, the head, shoulder and hip alignment: head over the shoulders which are over the hips. Also notice that the vertical line where your spine would be drops somewhere to close to the center of the foot. When the head is titled too far forward, it creates strain on the neck and back that will stress you neck and shoulders over time. The head is also heavy so having it off your upright axis will throw your balance off when you start to move. The impact that has on the gait of your walk will also make it hard for you to walk smoothly. Take the Sway Back figure as another example. It will be possible for you to adapt to this posture and hold your balance on both feet. Leading and following with this posture will have challenges. When holding your partner, you will have to create some distance in the torso area which will take away a key way to signal your lead. You would also be putting your follow in a forward lean which may result in you bearing the weight of your partner as you walk. That's a lot of work for a chill kind of dance. You will also be 'invading' your dance partner's space with your knees which will not be comfortable at all. When walking backwards, you will also have to manage the momentum you create and as a lead you will also have to worry about your partner's weight forward as you walk back: you are more likely to walk faster and faster over time, to keep from falling backward. I pay attention to the posture of my students and how they hold themselves when they walk. For some, due to chronic stress, body mechanics that were developed to support or compensate for injuries, their natural posture is not ideal. The human body is wonderful at adapting and because of this, when our bodies have been in the wrong posture for a long time, resetting it back to an optimal place can be difficult. What is "normal" in bad posture will feel more comfortable at first and what is optimal will feel so out of place. This is where I highly recommend doing basic foundation steps in front of the mirror so you can see how aligned your body is as you move and make the adjustments that are needed based on what you see so that when you connect with a partner, you are aligned well. I also recommend just doing breathing exercises with arms to engage the whole body in resetting to an ideal position while standing. Its also a great way to wake up your body to movement. When you stand in your base position, also pay attention to how the weight is spread on your feet. Are you too far forward? or are you too far back? Having your weight more on the heels makes it hard to move in general and you will have a tendency to walk backwards faster than you walk forward. Ideally your whole foot should be on the floor with more weight evenly distributed across that front half of the foot. This allows you the most grounded contact with the ability to move easily. Is the weight more to the outside of your foot? on the inside? This awareness helps with your balance. It is easier to balance with the weight is more on the inside (near the ball of the foot). Are your feet pointed the way your hips are facing? This one helps one we start to move. Have your toes over rotated outside ( like a ballerina) or inside will affect the way you connect to your partner and how smoothly you can walk together. To start, its best to have feet and hips pointed in the same direction.